I have used Sybran for snow removal for many years. They are excellent. They are fast, reliable and do great work. They clear not only the driveway but also the steps and landing. After large storms they come and push back the snowbanks so I can see the road. This year after a late storm they even came after the contract had expired. This is a highly professional company that cares for its customers. With the amount of snow we get here you have to use someone you can trust for snow removal and Sybran is that company. I have been lucky enough to have Sybran do my fall cleanup and snow removal for the past four years! They always do an outstanding job, my driveway is always cleared before I head out to work and even have worked past the contract date! I would, and have, recommend Sybran to anyone who is looking for quality and dependable work. I hired Sybran to clear my parents driveway this past winter. It was the best decision I made. After hearing the horror stories of snow removal companies taking your money at the start of the year then rarely if ever showing up I was so impressed by them. Not only did they come early and often to make sure the driveway was cleared so the car could get out and my parents get on with their day but they also came back if the day was still snowing to clear the driveway again when needed. That was amazing because the city plows love to block you in and trap you with some of the heaviest, hardest snow banks. I couldn’t be more happy and ultimately it gave me peace of mind that my parents were not out in bad weather trying to clear their driveway. 100% if you are looking for snow removal, this is the company to call. Sybran is exceptional. Their employees are friendly and efficient, and dealing with the company a breeze. Inquiries are responded to immediately. We have used Sybran for several years for removing the snow in our driveway, and they always exceed our expectations. I appreciate that they show up early in the day, but after the City's snow plow makes the dreaded snow-wall at the of the end of the driveway. I am impressed that, in the wake of the last ice storm, and in spite of our contract having expired, Sybran still showed up to remove the sloppy icy mess on our driveway. My parents, who went with a different snow removal service, were unfortunately left to shovel their driveway in the aftermath of the storm. We could not be more pleased with our choice to use Sybran for our snow removal year after year. Thanks to the guys at Sybran, I can get out of my driveway! Ice storm in April and I wasn't sure if my contract was over. I cheered when my guy showed up. Now I can get out of my driveway. These guys are awesome! We here at Georgian Chevrolet have been extremely pleased with the service provided by Sybran Property Maintenance. Sybran has been planning, planting, and maintaining our extensive gardens for last two years. We appreciate the professionalism and dedication that is consistently shown by the entire team. Every year our gardens look fabulous! Sybran Property Maintenance have been looking after our Company’s lawn care and gardens for 3 years and have been most, caring, attentive and professional in all they do. They have top notch equipment and understand how important it is to display attention to detail and consequent professional image for our model home and business. I have personally worked with Bryan for the past 4 years. Sybran Property Maintenance was responsible for the maintenance of the property I managed prior to the Hampton Inn & Suites. I asked Bryan to take over this property as his work is incomparable. Bryan is always professional and on site to ensure customer satisfaction. I have found this company extremely accommodating to ensure the appearance of the hotel is inviting through all 4 seasons. 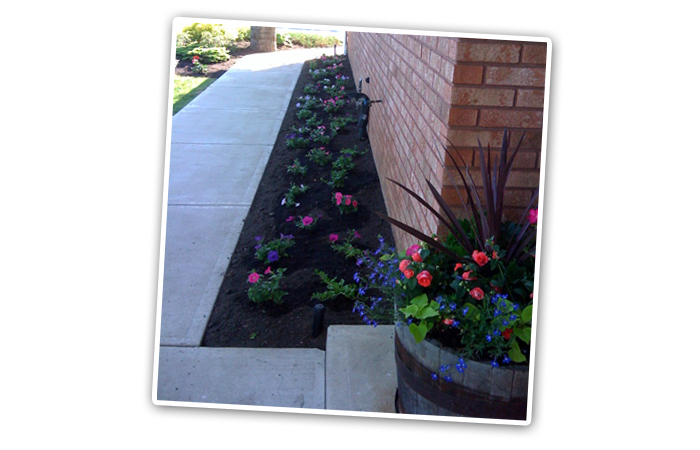 I would highly recommended Sybran Property Maintenance to anyone looking to have their business's curb appeal made both appealing and safe. Sybran has been providing me home lawn care and winter snow removal for over 3 years now and after having less than adequate service from other services I finally found a company that worked for me. Regardless of the weather or time of year these guys are always here and ALWAYS get the job done, they are personal and professional and have never had a request that was not fulfilled. I cannot say enough good things about these guys and this company. I would highly recommend Sybran to anyone one who is looking for reliable, honest and professional property maintenance, excellent service.